Sportsmen strive to bring home game in the most efficient manner. It’s essential that you understand the anatomy of the BC game animals you plan to hunt and learn how to place a shot for a clean kill. The most effective shots are delivered to an animal’s vital organs—the heart and lungs. In large game animals, these organs lie in the chest cavity behind the front shoulder. Because the heart surrounds the lungs, a lung shot is the most effective shot for a big game animal —a near miss may result in hitting the heart. The area of the vital organs contains major blood vessels and arteries. A shot in this area causes considerable bleeding. If the animal doesn’t die immediately and tries to flee, the blood trail it leaves is easy to track. Keys to hitting an animal in the vital spot are good marksmanship and patience. Wait for the best possible shot. Broadside is the preferred shot angle for larger game animals, for both firearm and bow hunters. Firearm: The best target is the shoulder and chest area. A bullet of the correct weight and fired from a firearm adequate for the game will break the shoulder bone and enter the lungs or heart. Bow: The best shot for the largest big game animals. Aim straight up from the back side of the front leg, one-third of the way up from the bottom of the chest. An arrow will penetrate the ribs but not the shoulder bone. Firearm: This position offers several aiming spots on all big game. The area just behind the shoulder is the best spot for penetrating vital organs. Focus on hitting the chest area above the opposite front leg. Bow: Good opportunity for a clean kill on certain big game and some smaller animals. Not a good shot for a larger game animal because their massive stomachs and intestines block a clean shot to the lungs or heart. Quartering-Toward is when an animal is facing toward you but at an angle. Firearm: Presents a clean shot to the vital organs. A shot can be taken if the gun is already trained on the animal. Aim at the front of the shoulder of the near front leg. Bow: This angle offers a poor shot opportunity and should not be taken. Firearm: this angle can be effective if the firearm is adequate and already positioned for the shot. However, rarely results in a clean kill and ruins a lot of meat. Aimthe at center othe f chest to hit vital organs. Bow: this angle offers very poor shot selection and should not be taken. 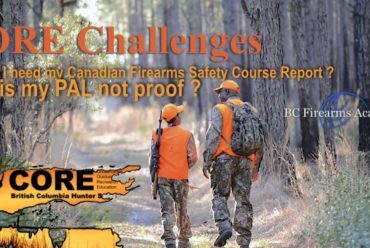 • Rear-End shot should not be taken by hunters using firearms or bows. It’s a hunter’s ethical responsibility to stop the hunt and search for any wounded animal. 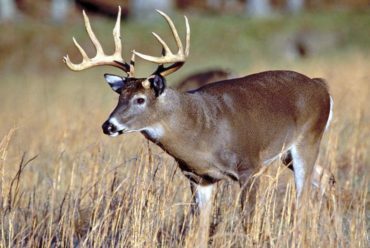 Wait for at least a half-hour to an hour before trailing deer, unless the downed deer is in sight. Make a practice of carefully observing every movement of the game animal after you shoot it. Investigate the ground and trail after shooting before assuming you missed. At the shot site, look for signs: blood on the ground or vegetation; broken twigs or branches, or scattered leaves; “dew” line if early in the morning; tracks; hair, meat or bone fragments; downhill trails, especially toward the water. If you lose the trail, search in a circular or grid pattern and try to pick up the trail again. Use fluorescent orange flagging to mark each blood trail in case darkness or weather forces you to quit the search and return the next day—marking also shows where to look for more signs if you lose the trail. Large animals should be approached carefully from above and behind the head. If the animal appears dead, wait a short distance away for a few minutes. Watch for the rise and fall of the chest cavity. Notice if the eyes are closed—the eyes of a dead animal are usually open. You can be certain that the animal is dead if the eye doesn’t blink when touched with a stick. If the animal is still alive, kill it with a quick shot to the base of the ear. If you wish to mount the head, place your shot in the heart-lung area. For bowhunters, the only option is placing the arrow in the heart-lung area.